Adapted to the tropical heat. Today was 37 degrees Celsius, with humidity that made it ‘feel like’ 43. Crossed many busy busy roads without getting run over even once (you have to see the traffic to believe it, and understand that a crosswalk is not where cars or motorbikes stop for pedestrians, but where pedestrians are encouraged to cross, for reasons that are not yet clear to me). Ordered, consumed and loved local food including the very famous pho. Went on a street food tour with an amazing guide, and cook, named Y (pronounced Ee) who introduced me to above named delicacies). Met the staff at The Gioi Publishing House, who I will spend some of my time with, and who have welcomed me very warmly. And managed not to be too dreadfully homesick. Another creature I am fascinated by is more lively. Each evening little geckos climb the glass windows of my balcony. They are a little camera shy – I guess because I am big and scary – but luckily I bought a new camera just before I left home and it has big lens, so I was able to get a few shots. The light effect in the background is from the lights across the water outside. That’s it for me for this Poetry Friday. I’m off to explore more of Hanoi, and then to check out all the other Poetry Friday goodness from my fellow poetry loving friends. 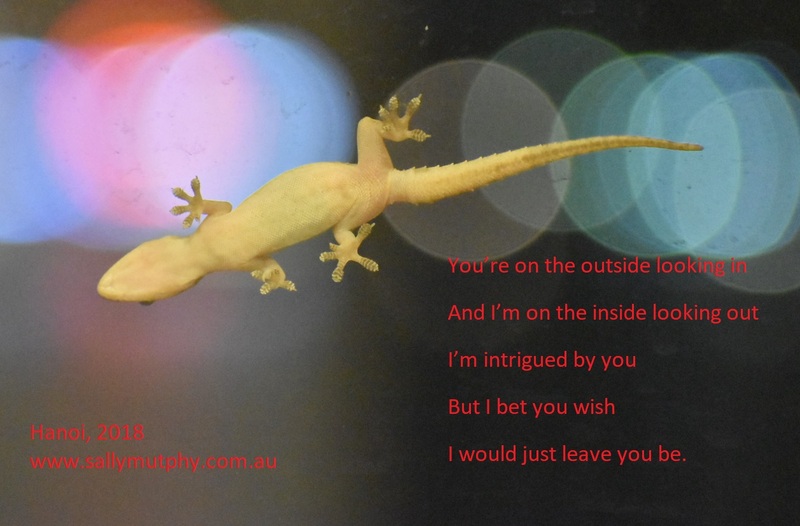 You can follow the Poetry Friday goodness by visiting the roundup at Beyond Literacy. Last time Sage Cookson had one of her excellent adventures was last Christmas. So, if you are a fan of her series, you might be wondering where she’s gone. Well, good news – because Sage is back! And this time she’s off to Townsville, where, coincidentally, I have just been. Of course, Sage thinks she’s off to blue skies and time by the pool, but she should know by now that something always go wrong. And this time, there’s a storm brewing. 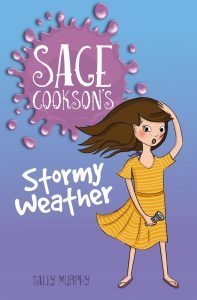 Sage Cookson’s Stormy Weather is in shops from September 1. Missing Bookweek? Book Now for 2019! Phew, Bookmonth (Bookweek spreads over a whole month for me!) is over for another year. It’s my favourite month of the year, travelling from school to school, library to library, talking about books and writing to hundreds of wonderful children, teachers and librarians. 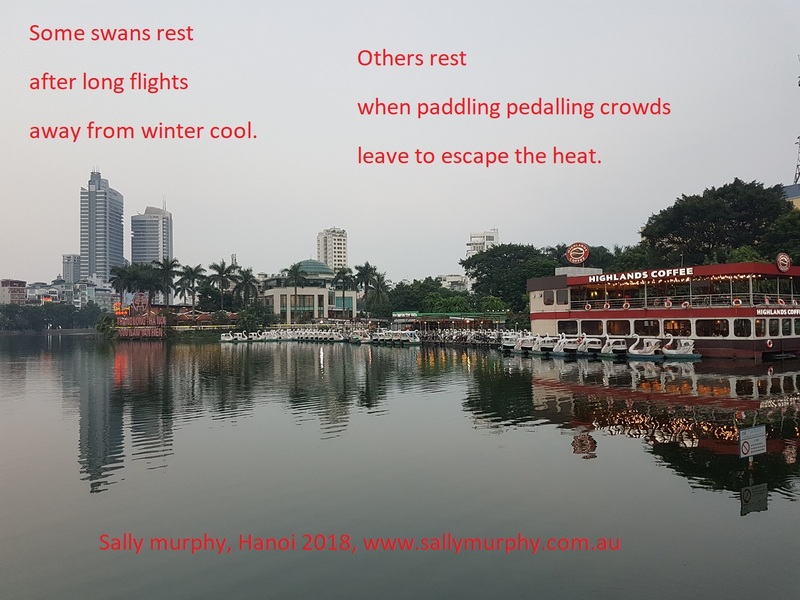 But once it’s over I do need a little rest – and this year, I am heading off to Hanoi for twelve weeks to write write write, so I have even more to share next year. This means I am not available for school or library visits for the remainder of the year. But the good news is, I am open for bookings for 2019. And the even better news is, because I love early birds, if you book now you will receive a free signed copy of one of my books which you can add to your collection, use for fundraising, give as a prize, or whatever else you would like to do with it. I can speak to audiences of all ages and sizes- you can see details of what I do here. So, what are you waiting for? Book now for 2019! In two days I am off on an adventure. Maybe the biggest adventure of my life. I’ll be packing my bags, hugging my family goodbye and jumping on a plane, bound for Vietnam, where I will be living in Hanoi for twelve weeks. Yes, you read that correctly TWELVE WEEKS. This will be my first time ever living alone, and I am going to be doing it for 12 weeks. The longest (by a long shot) I have been away from my wonderful children and husband. And certainly the longest I have been without seeing anyone I know – though I am hoping I will know lots of new people very soon. So why am I doing his? I keep telling people I’m running away, but really what I am doing is running to. To new experiences, new understandings, new challenges and, ultimately, new words. Because what I am planning to do in the midst of experiencing life in Hanoi, is to write a new book, and hopefully also new poems and maybe even some new articles. And, of course, there will be blog posts here on my website. And I’m NOT running away – I am walking away, quite nervously, from my comfortable, happy life in Australia, and my wonderful family – kids, grandkids, my beloved and more – because this wonderful opportunity is too good to pass up. I am going to miss them terribly – heck, I’m already homesick just thinking about being away – but they will be just a phone call or email away, and 12 weeks will probably fly by and I will be back with them again. This amazing opportunity has come about through the amazing Asialink Arts Program, and with the funding support of the the Western Australian Government through the Department of Local Government, Sport and Cultural Industries. 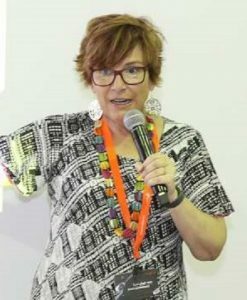 The Aisalink Arts program allows creative artists to spend extended periods of time in a range of Asian countries, working on new projects and building creative partnerships. In my case, I am lucky enough to be spending my time in Vietnam, and to be supported during my time there by a Vietnamese publisher, The Gioi. 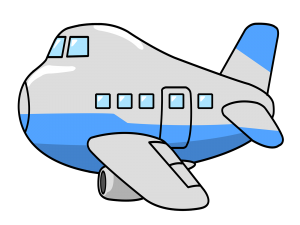 I have a book project planned for my time there, but I won’t give too much away just yet – I have to write it first! But I will say that it will be set in Hanoi, and involve an Australian main character. It won’t be an autobiography, but of course will be informed by my experiences there. If you want to follow my travels, I plan to blog and share photos here, as well as on Instagram. Now, back to my packing! 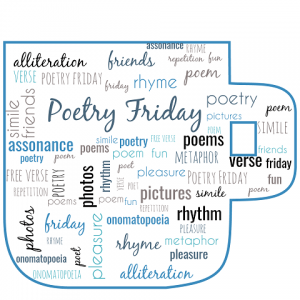 It’s Poetry Friday and this week Christie has issued a challenge for Poetry Friday: she has asked Poetry Fridayers to share a bird poem. I instantly knew just what I wanted to write about. I had a perfect photo of a bird, which I have shared here on my blog previously. Except it was never supposed to be a picture of a bird. It was supposed to be a picture of a lighthouse. But, in a moment of perfection I could never have planned, just as I snapped the photo, a seagull ducked (seagulled?) in front of my camera and ‘click’ I took the shot – and I had a photo which will always be one of my favourites. With all that in mind, knowing what to write about to go with the photo was very easy. I give you: Photo Bomb. Thanks to Christie for hosting this week’s roundup at Wondering and Wondering. Head there now to see lots more poetry, birdy goodness. It’s August, my busiest month of the year. With Bookweek next week, I am busy visiting schools and libraries, talking about books and writing. Lucky me! This is one of the best parts of my job. But, when August is over, so too are my author visits for 2018. This is sad for me, because I love what I do, but also exciting for me, because I am spending 12 weeks in Hanoi, Vietnam, where I will be busy writing new things. More about that in an upcoming blog post. So, no more bookings for 2018. 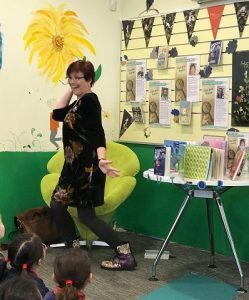 But, when the calendar ticks over to 2019 I will be ready once again to visit schools, libraries, festivals, writing groups, community centres – you name it. I want to fill my diary to overflowing! 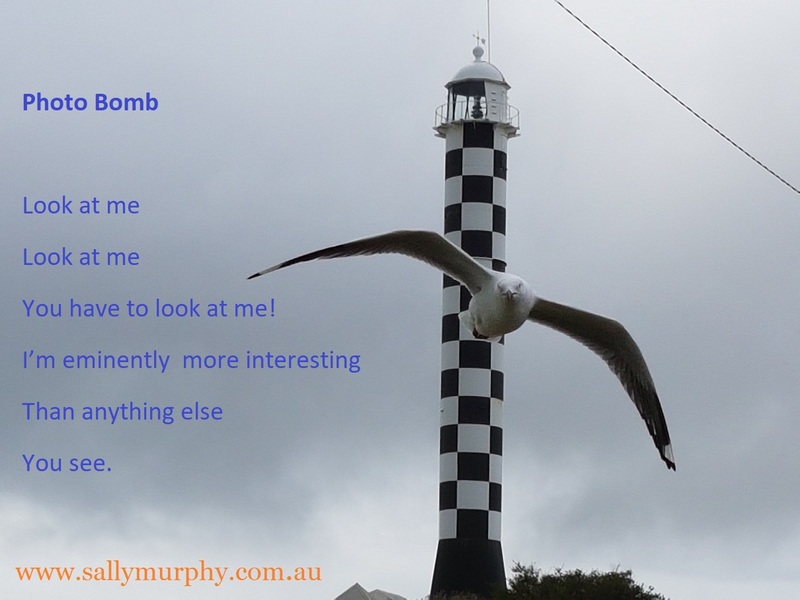 So, if you want to see Sally Murphy in person next year, now is the time to book. Booking early gives you the pick of the dates! And, as an August and September bonus, if you book now I will donate a free signed copy of one of my books to your school/library/organisation. You can add it to your collection, use it as a prize, or whatever you like! So, what are you waiting for? Book now!